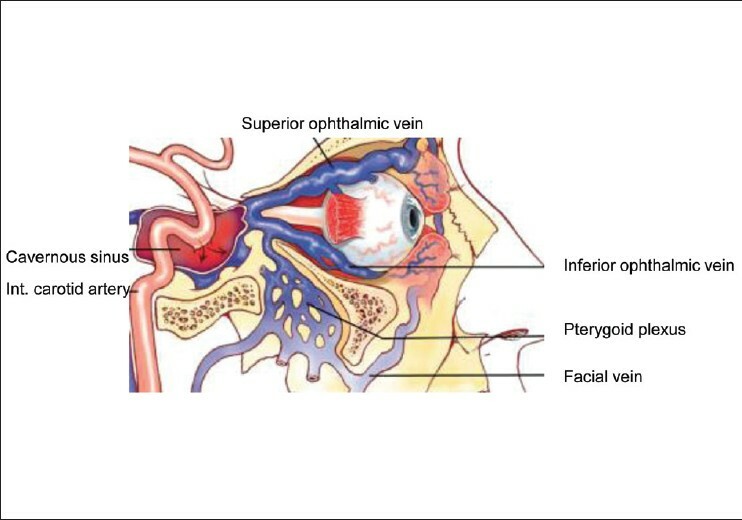 Explanation : Orbital ultrasound blood flow studies with color Doppler imaging provide a noninvasive method of diagnosing carotid artery–cavernous sinus fistula, by demonstrating reversal of flow (“arterialization”) in the superior ophthalmic vein. Definitive diagnosis requires angiography, often initially by CT or MR angiography. Carotid artery–cavernous sinus fistula sometimes occurs spontaneously due to rupture of an intracavernous internal carotid artery aneurysm, they usually follow severe head trauma causing damage to the intracavernous internal carotid. Physical signs include marked orbital congestion with chemosis, pulsating proptosis, raised intraocular pressure, retinal hemorrhages, and ophthalmoplegia, as well as a loud bruit. Reference : Sullivan JH. Chapter 13. Orbit. In: Riordan-Eva P, Cunningham ET, Jr. eds. Vaughan & Asbury’s General Ophthalmology, 18e. New York, NY: McGraw-Hill; 2011. Embryology: The carotid body originates from the third branchial arch and from neuro-ectodermal derived neural crest lineage. Location: The normal carotid body is located in the adventitia or periadventitial tissue at the bifurcation of the common carotid artery. Supply: The gland is innervated by the glossopharyngeal nerve. Its blood supply is derived predominantly from the external carotid artery but can also come from the vertebral artery. Carotid body tumor is a rare lesion of the neuroendocrine system. Reference : Lin PH, Poi M, Matos J, Kougias P, Bechara C, Chen C. Arterial Disease. In: Brunicardi F, Andersen DK, Billiar TR, Dunn DL, Hunter JG, Matthews JB, Pollock RE. eds. Schwartz’s Principles of Surgery, 10e. New York, NY: McGraw-Hill; 2014.